As of this writing, the names and even the number of dead and injured at Sandy Hook Elementary School in Newtown, Connecticut, are not yet known. Indeed, right now there are only two things which are certain. The first thing we know is that a terrible tragedy -- an unnecessary and heartbreaking catastrophe -- has taken place. Today, anyone who has ever loved a child is torn between giving thanks their loved ones have been spared and offering a sympathetic prayer for those whose children are the victims of cruel hatred. The second thing we know is that people have questions. We question how a man could murder his mother, who had given him life, and children he had never met. Many reasons will be put forth, but only one will hit the mark. The right reason is this: the devil searches this sad and sinful world, looking for souls who are receptive to his suggestions. Not often, but occasionally, he will find a person who eagerly embraces the most sadistic of suggestions and willingly makes the unthinkable and the unimaginable a sad and sorrowful reality. But I said there were questions. It's true, there are more than one. Horrified by such inhuman hatred, people will ask, "Where was God? Why didn't He do something? Why did He leave these children unprotected?" The answer to all of those questions can be found 2,000 years ago, outside the city walls of Jerusalem. There, nailed to a cross on a skull-shaped hill called Calvary, God's Son, the Savior of the world, gave up His life, so the world might be saved. Forsaken by His Father, Jesus died alone, so Sandy Hook's teachers and students would not be alone when confronted by a gunman intent on mayhem and murder. 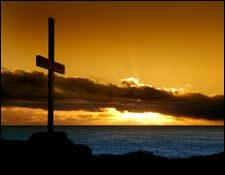 Deserted by those who had followed Him, Jesus died alone, so that those who acknowledge Him would always have Someone on whom they could rely. Hated by the world, Jesus died alone, so all who trusted Him would be surrounded by the love of God. Where was God? He was in Sandy Hook, just as He is in your home right now. Why didn't God do something? My friends, you should know, even before the authorities were informed or the police were sent, Jesus' nail-pierced hands had taken hold of the believing teachers and students and brought them to a place where they would be eternally safe from evil. He has done the same for hundreds of millions before today; He will do the same for each of us someday. But this day, on this day of tragedy, we can be sure that the crucified and risen Lord Jesus has done all that was necessary, so comfort might be given to grieving hearts. Today, we join the apostle and say, "For I am sure that neither death nor life, nor angels nor rulers, nor things present nor things to come, nor powers, nor height nor depth, nor anything else in all creation, will be able to separate us from the love of God in Christ Jesus our Lord." THE PRAYER: Dear Lord, comfort those who mourn with the knowledge that today a gunman has not had the final word, and a grave will not be the final finish for those who have been murdered. Help us share this truth: Because Jesus lives, so will those who live and die in Him. May that be the good news we share in the face of such bad news. In the Savior's Name I ask it. Amen.